Finding the right puzzles for a kid can be a, er, puzzling time (sorry 🙈). Especially as there’s so many to pick from. You want to get them something that’s going to stretch their lil’ imaginations, but not so hard that they get frustrated or bored (trust us, we’ve been in this predicament). We’ve got loads of cool puzzles here at KIDLY and to help you find the perfect fit, we’ve put together a little guide to help you piece together which ones are right for each stage. They probably won’t be grasping the idea of puzzles and games just yet. But it doesn’t mean you can’t start off their journey (subconsciously of course). Once they are starting to reach out for toys, this Wee Gallery Organic Puzzle Sensory Ball, is a great first intro into the puzzling world. Featuring monochrome graphics and fun textures, it’s great to get their minds ticking and hands moving. 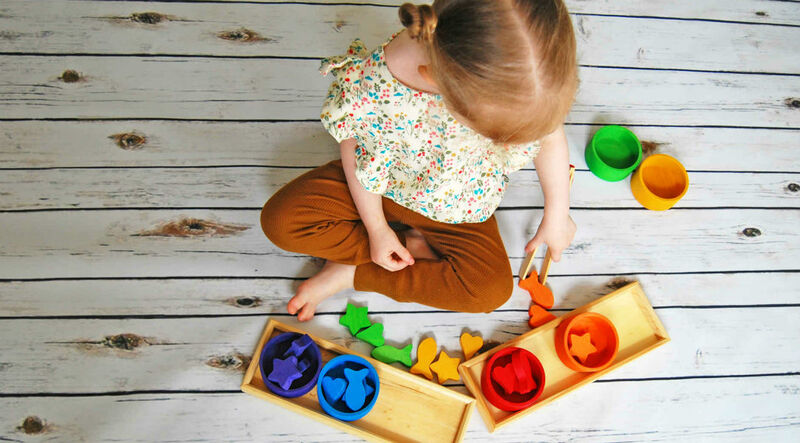 When they hit the 11 month stage and are beginning to grasp the idea of different colours and shapes, this simple Janod I Wood Shapes & Sounds 6 Block Puzzle is a great way to ease them into their puzzling adventures. Featuring 6 easy to grab wooden pieces, they’ll be matching stuff up quicker than you can say ‘Mastermind’. 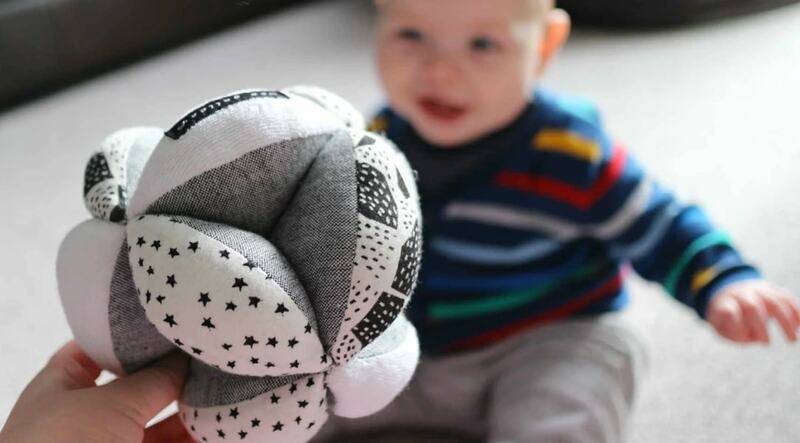 Wee Gallery Organic Puzzle Sensory Ball (£30). We love this stage. They’re into everything and anything and ready to learn. So take advantage. Get those little brains thinking, those fine motor skills tuning and (hopefully) bums sitting. Once they start recognising shapes and colours, get them in on the action and begin their problem solving journey with the Grimm's Wobbly Stacking. Brightly coloured and with simple shapes to sort, it’s a great way to get their minds puzzling. Spotting them trying to fit things together? You can’t go wrong with a simple fit the pieces puzzle. We love this Janod Fruit Tree Puzzle, which features easy to grab fruits in a stylish design. They’ll spend hours trying to get them into all the right places - great for their concentration and dexterity too. Bonus. At this stage, puzzles are a great way to get them problem solving as well as helping them to identify different shapes and colours. So pick great pieces of kit to really harness these. If they’ve cracked that shape sorter and looking for a similar challenge to harness those dexterity skills, this Bigjigs Twist and Turn Puzzle Board is the perfect piece. Featuring three pegs with brightly coloured wooden squares, triangles and circles, just encourage your lil’ Einstein to slide them down again until they reach the base. Babe into animal spotting? 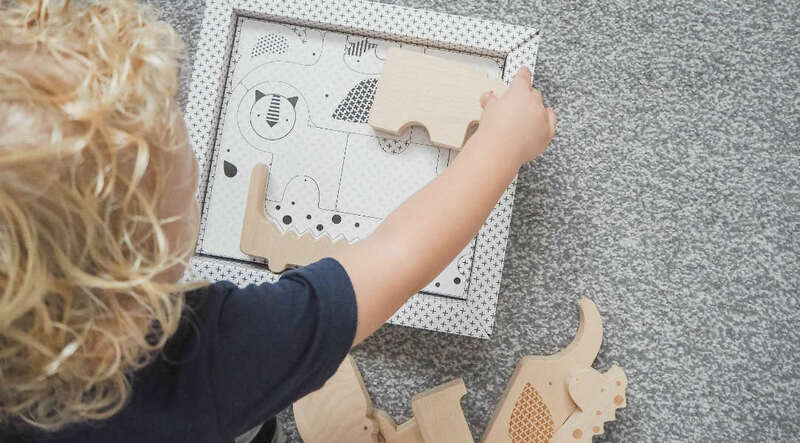 We 💗 this Petit Collage Wooden Puzzle and Play Set. Featuring animals that need to be placed together, this stimulating puzzle will help them learn while they develop their motor skills too. Petit Collage Wooden Puzzle and Play Set. 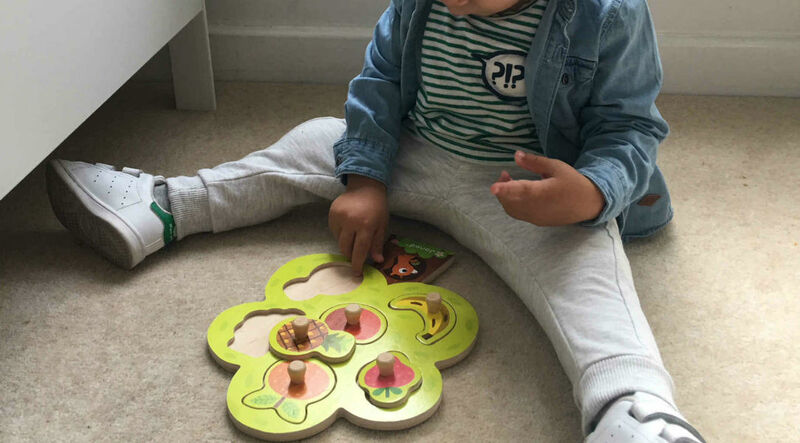 At this age, puzzles and games come into the mix, helping them with problem solving, hand and eye coordination and cooperative play (super important when they’re just about to start nursery and pre-school). Once their starting to think for themselves and create stories, fuel their imagination and help them with their cognitive skills with this Janod Magnetibook Educational Toy. Featuring a range of shapes that can be placed on a magnetic board, this little gem is a great way to capture their creative skills. And it’s big enough to share with siblings 😉.